What? Has Midge gone daft? Is she writing a story about a grocery store – a mini market? You can bet your pjeeeze I am! 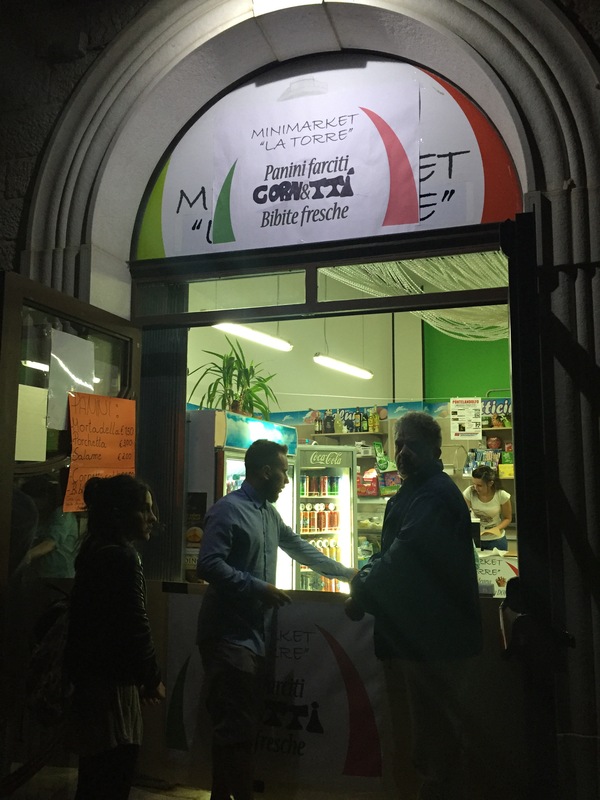 La Torre Mini Market is the creation of a young married couple – Luigi Silvestri and Mariavittoria Stringile. It is energizing to see young people get in touch with their entrepreneurial spirits and take the idea of alimentari to a new level. Before they opened, they did something I am so impressed with. They sat down with Pierino Di Angeles who had the Alimentari that I adored and asked her where she used to buy her out of this world mortadella ! I bet they asked her other well founded questions too. This little grocery store and deli – with the stress on the deli – not only carries all the stuff you need but ran out of just as you needed it. But also stocks things that are a wee bit exotic like – truffle oil, goat’s milk, unusual spices and baked goods including real dark – think those old Brooklyn bakeries – healthy rye bread! The deli meats never looked dried out and dying in the case. Salamis, prosciutto crudo or cotto, tacchino, all have been noshed on in our house to great satisfaction. Even though we enjoy going to the local Caseficio – place that makes cheese – for our cheese quotas, I’m glad to see that Luigi and Maria Vittoria stock mozzarella di buffalo made a wee bit up the road. 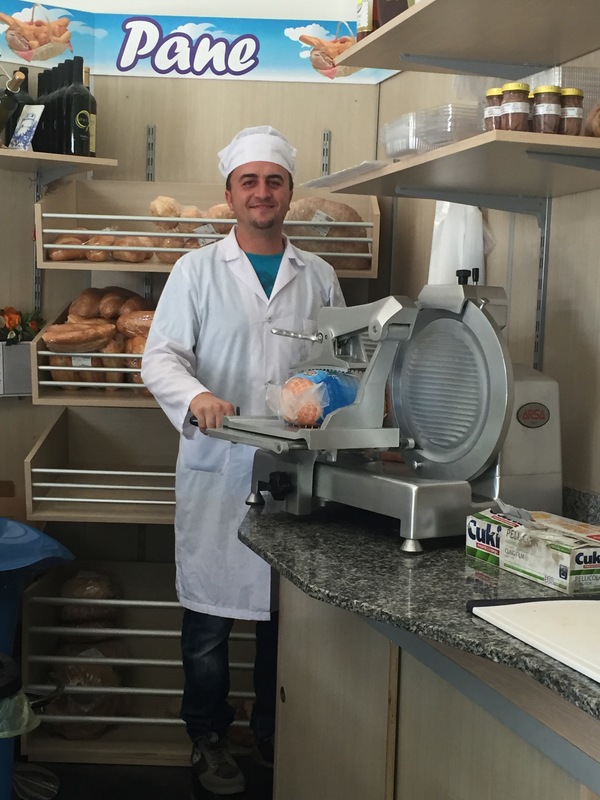 l Casolare di Alvignano has won the 2016 “Oscar” for best mozzarella in Italy. I asked them why they decided to take the plunge and work 24 hours a day building a little mom and pop community store. Mariavittoria explained that her family moved to Germany and she and Luigi could have gone there to look for work. Something held them back – their absolute love for Pontelandolfo and Pontelandolfese! 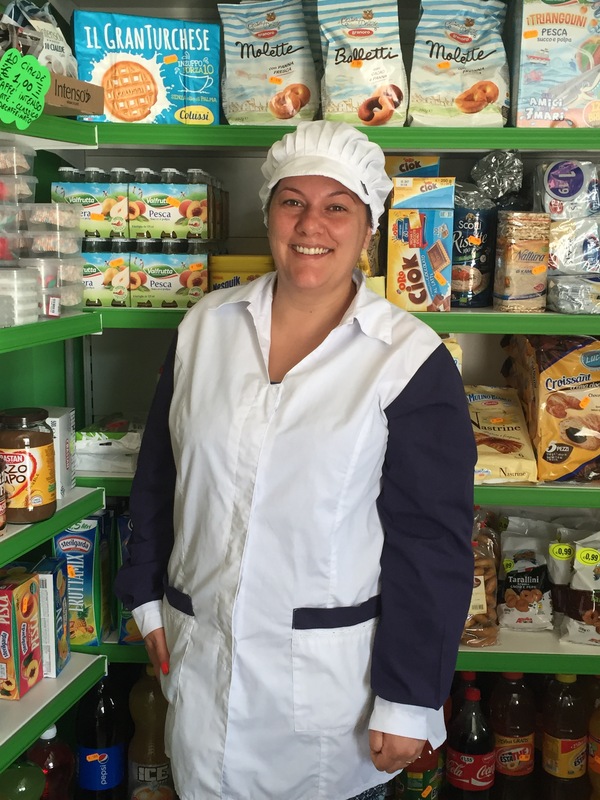 They chose to open a mini-market because they realized that after Pierina retired, there was no place in the historic center to buy what she used to sell. They wanted to fill that void. They more than fill the void! I was super impressed during Pontelandolfo’s August week-long Festa to see them open almost 24 hours a day. They put a table in their doorway and sold canned beverages and panini to late night revelers. Daily, construction workers dash in to pick up sandwiches to carry for lunch. Frantic Midge runs in – because no one else is open on Sunday – to see what she can route up for Sunday pranza. The couple have a son and are expecting another member of the family this winter. Soon two little tykes will be running around and asking if I want some delicious mortadella!